Finished Size 8" wide and 50 1/4" long. Yarn Harrisville Designs WATERshed (100% wool; 110 yd [101 m]/1 3/4 oz [50 g]): #979 Nelson (MC), 4 skeins (see Notes); #921 mallard (CC), 1 skein. Notions Cable needle (cn); tapestry needle; three 1" buttons. Gauge 24 sts and 26 rows = 4" in Farrow Rib Cable patt; 20 sts and 26 rows = 4" in Farrow Rib. 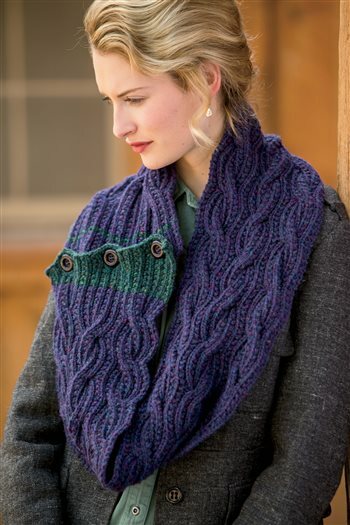 Worked in a farrow-rib cable pattern with contrasting ends, the Tandem Scarf is reversible and buttons into a cowl. One end is angled with short-rows for a dashing detail.